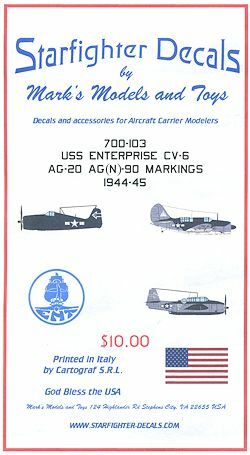 This latest carrier set from Starfighter Decals covers the USS Enterprise cruises of 1944 and 1945. The first cruise was with Air Group 20. This one featured F6F-5 Hellcats, SB2C-3 Helldivers, TBM-1C Avengers and a detachment of F6F-3N Hellcats. These planes wore the white triange marking. The Hellcats were in overall dark sea blue while the Helldivers and Avengers wore the tricolor scheme. The next cruise was an all night attack Air Group (Night) 90. This time it had several varieties of Hellcat all in dark sea blue, while the TBM-3D Avengers had a modified tri-color scheme with the undersides in black. 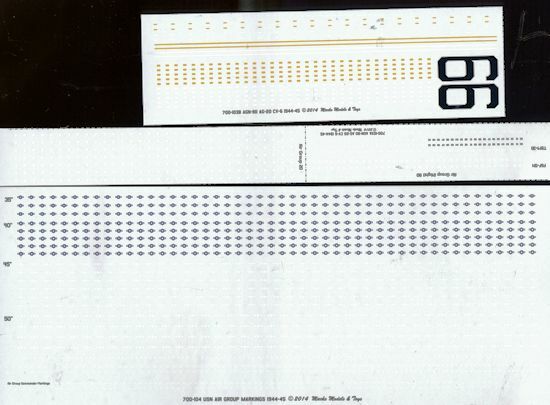 In addition, you get the markings for the USS Enterprise as well. The major deck markings have been provided in both white and yellow, which is a nice touch. The decals themselves are nicely done. It is a real challenge to show small white markings on a very light background so I have enlarged and darkened a section of the tail markings for you. I also thought these geometric patterns were also on the wings, but apparently not. As you can see from the main image, there are markings for dozens of planes. The full color instructions provide complete placement and painting information, including the measure used on the ship. Starfighter has plans for other markings so stay tuned.